This 2004 photo shows the westbound I-80 at EXIT 64A (NJ 17 northbound) in Hackensack. On the left is the main transmission tower for WABC radio. (Photo by Steve Anderson). LINKING THE GEORGE WASHINGTON BRIDGE WITH THE POCONOS: In 1936, the Regional Plan Association first recommended the construction of a network of expressways that were to supplement existing parkways in the New York metropolitan area. Unlike the existing parkways, the expressways were to be open to all traffic. One of the recommended routes was to extend from the George Washington Bridge approach in Fort Lee west to the Delaware Water Gap, and then northwest to Scranton. (This route was to precursor to today's I-80 and I-380.) Through New Jersey, the expressway was to supplement the existing US 46. After World War II, New Jersey officials, with the assistance of Triborough Bridge and Tunnel Authority (TBTA) chairman Robert Moses, revived plans for an east-west expressway from the George Washington Bridge. Specifically, the 1955 Joint Study of Arterial Facilities, organized by the Port of New York Authority and the TBTA, established the blueprints for expressway and bridge construction over the next decade in the New York metropolitan area. In New Jersey, the addition of the lower deck to the George Washington Bridge would call for the expansion of the approaches and plaza. The existing highway facilities in Bergen County now handle virtually capacity loads. They would not be able to accommodate anticipated future traffic. George Washington Bridge traffic is expected to grow at a rate of four percent a year; local Bergen County traffic at a higher rate. 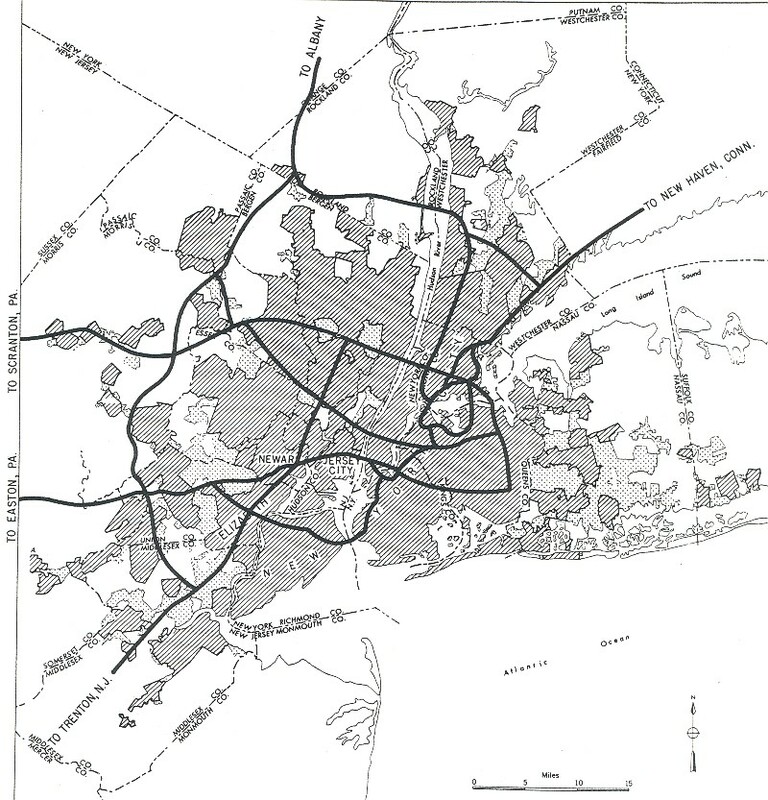 In order that the interstate and local traffic in 1960 may be accommodated, it would be necessary that the highway system in Bergen County be expanded, particularly for east-west traffic. A tentative plan agreed upon between the Port Authority, the New Jersey State Highway Department and Bergen County officials calls for a new six-lane, limited-access, east-west highway between existing routes NJ 4 and US 46, with connections to the major existing routes. An interchange would be provided with the Garden State Parkway, and another could be provided with the New Jersey Turnpike if it is extended northward from its present terminus. The Port Authority has advised the New Jersey State Highway Department that it would provide the state's share of the total estimated cost of $60,000,000 for this proposed new Federal-aid arterial highway. This would be considered as part of the project cost of the lower deck of the George Washington Bridge. Later in 1956, the Bergen-Passaic Expressway became eligible for inclusion in the National System of Defense and Interstate Highways, making it eligible for 90 percent Federal financing, with the remainder to be financed by the state of New Jersey and the Port Authority. New plans developed by the New Jersey State Highway Department called for an extension of the Bergen-Passaic Expressway west to the Delaware Water Gap. Originally designated "FAI Corridor 102," the freeway received the preliminary designation I-82 in late 1957. (I-82 continued along the present-day I-80 / I-380 route to Scranton, where it joined I-84.) In mid-1958, when Interstate route plans were finalized through northern Pennsylvania, the New Jersey route was re-designated as part of the transcontinental Interstate 80. Interstate 80 is the easternmost portion of the transcontinental freeway from San Francisco to a point four miles west of the George Washington Bridge. (Interstate 95 continues to the bridge.) In New Jersey, I-80 will relieve US 46 of through traffic, thereby benefiting both local and commuter traffic. DESIGN AND CONSTRUCTION OF I-80: The first piece of I-80 in New Jersey was a 4.9-mile-long, four-lane stretch near Columbia that opened in 1953. This section, part of the old US 611, begins at a toll bridge operated by the Delaware River Joint Toll Bridge Commission, and ends at EXIT 4 (US 46). Some characteristics of this pre-Interstate section include tight curves, abbreviated acceleration and deceleration lanes, and a 50 MPH speed limit. Later (post-1957) stretches reflected contemporary Interstate-standard design. These stretches, located between the Delaware Water Gap and the George Washington Bridge approach, feature at least six 12-foot-wide lanes (and additional climbing lanes where appropriate), 12-foot-wide paved shoulders, 1200-foot-long acceleration and deceleration lanes, wide medians, and a 70 MPH speed limit. The entire 68-mile length of Interstate 80 through New Jersey, which was completed in November 1973, cost $345 million to construct. The original US 611 section between the Delaware River toll bridge and EXIT 4 (US 46) in Columbia is four lanes wide. This section of I-80, which opened in 1953, carries approximately 50,000 vehicles per day (AADT). Because of the substandard nature of the roadway, the speed limit on this section is 50 MPH. Continuing east through Warren and Morris counties, I-80 widens to six lanes between EXIT 4 and EXIT 34 (NJ 15) in Rockaway Township. An additional two lanes are provided in some locations for truck climbing lanes. The section between EXIT 4 and EXIT 26 (US 206) in Netcong opened in 1973. The section between EXIT 26 and EXIT 34 opened in stages between 1959 and 1963. The speed limit on this section is 65 MPH. As I-80 begins to traverse more suburban environs, it widens to eight lanes between EXIT 34 and EXIT 43 (I-287) in Parsippany-Troy Hills. The section between EXIT 34 and EXIT 39 (NJ 53) in Denville, which opened as a six-lane route between 1959 and 1961, was widened to eight lanes to accommodate median HOV lanes. The section between EXIT 39 and EXIT 43 opened in 1973 as an eight-lane section; two of these lanes were converted to HOV use in the 1994. In late 1998, the HOV lanes were converted to general-use lanes. The speed limit on this section is 65 MPH. East of I-287, I-80 widens to ten lanes in a 2-3-3-2 configuration between EXIT 43 and EXIT 47 (I-280) in Parsippany-Troy Hills. This section, which opened in 1968, carries approximately 120,000 vehicles per day. Prior to the mid-1990's, this had been an eight-lane, 2-2-2-2 configuration. Today, I-80 through traffic uses the inner roadways, since the outer roadways are used for traffic to and from I-287. The speed limit on this section of I-80 is 65 MPH. Traversing northern Essex County, I-80 narrows to six lanes between EXIT 47 and EXIT 53 (NJ 23 and US 46) in Wayne. This section of I-80 opened to traffic in 1968. The speed limit on this section is 65 MPH. Moving east through Passaic and Bergen counties, I-80 widens to eight lanes between EXIT 53 and EXIT 62 (Garden State Parkway) in Saddle Brook. This section opened in stages between 1965 and 1971. The speed limit on this section is 55 MPH. As I-80 comes to an end in Bergen County, it widens to ten lanes between EXIT 62 and EXIT 68 (I-95 / New Jersey Turnpike) in Teaneck. The inner lanes of the 3-2-2-3 configuration are devoted to express traffic, while the outer lanes devoted to local traffic. This section of I-80, which opened in 1964, is the busiest in New Jersey, carrying more than 160,000 vehicles per day (AADT). The speed limit on this section is 55 MPH. EXTENDING TO THE GEORGE WASHINGTON BRIDGE: In 1964, following four years of construction, a four-mile-link opened to connect the George Washington Bridge approach in Fort Lee with I-80 (Bergen-Passaic Expressway) in Teaneck. The ten-lane section continues the 3-2-2-3 configuration of local and express lanes from the eastern end of I-80. Originally planned as a straight-line route from I-80 to the George Washington Bridge, this section was rerouted after borough officials in Leonia filed suit with the New Jersey State Highway Department, citing that the route would run directly through the business district. The borough officials were successful in forcing the present alignment that curves around the northern boundary of Leonia. As you know, I-80 ends at I-95. The guidelines for numbering the Interstate routes have been established by the American Association of State Highway and Transportation Officials (AASHTO). 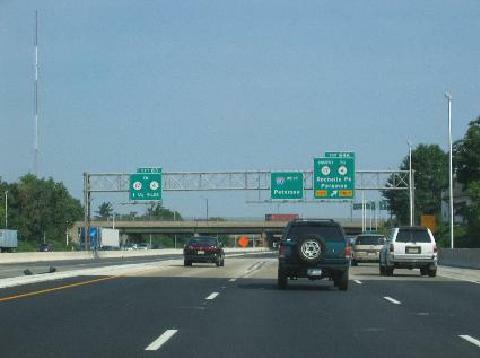 Officials specifically state that "dual interstate numbering be held to a minimum consistent with proper travel guidance." I-95, a major national north-south Interstate, is the logical terminus of I-80, a major national east-west Interstate highway. Therefore, we have no plans to change the numbering or signing of this section. THE RISE AND FALL OF THE HOV LANES: In March 1994, the NJDOT opened 10.5 miles of HOV lanes along I-80 between EXIT 34 (NJ 15) in Rockaway Township and EXIT 43 (I-287) in Parsippany. The two HOV lanes, which were constructed in the center median of I-80, cost $100 million to build. The new HOV lanes were not met with great fanfare. Although traffic continued to build on the general-use lanes, the HOV lanes often went unused. This reflected of variety of factors: lower fuel prices, decentralized suburban development, two-career families and multi-stop commuting. Since the HOV lanes were planned in the early 1980s, carpool usage had plummeted from 18 percent to 8 percent by the mid-1990s. Spurred by angry commuters, local politicians soon demanded the removal of the HOV lanes. Do the HOV lanes encourage carpooling? Do the HOV lanes carry 700 vehicles per hour for usage, while carrying as many people in the HOV lanes as the average of the general-purpose lanes? Do the HOV lanes reduce the current level of congestion and air pollution? After careful analysis of the situation, New Jersey has concluded that the lanes do not succeed in alleviating traffic congestion or improving air quality, and that their removal is warranted. Accordingly, the state intends to terminate their operation on Monday, November 30, 1998. We have taken a long, hard look at New Jersey's HOV lanes and concluded that they simply are not producing the results that we all had hoped for. The HOV lanes were converted into general-use lanes. Since the NJDOT found that the HOV lanes did not meet the national criteria for effectiveness, U.S. Transportation Secretary Rodney Slater waived the $100 million cost, most of which came from Federal funds, of the I-80 HOV lanes. For the three-month reconstruction period, four lanes of westbound I-80 traffic merged onto a temporary two-lane truss bridge that sat atop the 50-foot-long bridge damaged in the accident. Workers then demolished the outer lanes of the damaged bridge. After the outer lanes of the bridge were rebuilt, traffic was rerouted to them, allowing workers to dismantle the truss bridge and rebuild the two westbound lanes beneath it. At the end of the $6 million project, the NJDOT opened the reconstructed four-lane westbound bridge to traffic. In conjunction with the Delaware River Joint Toll Bridge Commission (DRJTBC), the NJDOT plans to widen I-80 to six lanes (three in each direction) from the Delaware Water Gap Bridge east to EXIT 4 (US 46 and NJ 94) in Columbia Township. Studies for the $630 million project were completed in July 2006. However, the I-80 widening project, which would be accompanied by a widening of the Delaware Water Gap Bridge superstructure, likely would not be completed until 2025 at the earliest. In a project not related to the proposed widening, the NJDOT plans to mill and resurface both directions of I-80 from the Delaware Water Gap Bridge east to milepost 8. The $16.5 million project is scheduled for completion in 2008. The NJDOT is expected to spend $9 million through 2009 for rockfall mitigation in Allamuchy and Roxbury townships. The NJDOT plans to mill and resurface 15 miles of I-80 from EXIT 28 (Morris CR 631) in Roxbury Township to EXIT 43 (I-287) in Parsippany-Troy Hills Township. The $23 million project is scheduled for completion in 2008. At EXIT 34 (NJ 15) in Rockaway Township, interchange movements that are currently missing (separate movements from I-80 eastbound to NJ 15 southbound and NJ 15 northbound, and from NJ 15 northbound to I-80 westbound) will be constructed. Geometric, structural and pavement deficiencies will also be addressed at this interchange. (In preparation for the project, the existing eastbound EXIT 34, which does not directly connect to NJ 15, has been re-signed as EXIT 33.) This project, which will be conducted in conjunction with the NJ 15 corridor improvement project, likely will be built after 2009. The NJDOT plans to rebuild and widen the ramps connecting I-80 with I-287 at EXIT 43 in Parsippany-Troy Hills Township. The $75 million project, which will include pavement rehabilitation of the I-80 mainline, replacement of bridge decks, and extension of acceleration-deceleration lanes, is scheduled to begin in 2009 and continue through at least 2012. In 2000, the first part of a comprehensive project to improve traffic flow at EXIT 53 (NJ 23-US 46) in Wayne was completed when an $11 million flyover ramp, which connects westbound I-80 to northbound NJ 23, opened to traffic. Other parts of the $75 million project, such as widening ramps between NJ 23 and US 46, and the construction of a new ramp from southbound NJ 23 to westbound I-80, are scheduled for construction after 2010. The NJDOT plans to reconstruct EXIT 60 (NJ 20) in Paterson. The $4.4 million project, which is slated for completion in 2008, will address weaving problems and redundant moves at the current interchange. The project does not include any new through travel lanes. Pavement rehabilitation and operational improvements were made on the local and express lanes between EXIT 62 (Garden State Parkway) and EXIT 68 (I-95 / New Jersey Turnpike). In this project, the first such rehabilitation along this stretch since the 1970's, pavement and bridges were rehabilitated, ramps were modified, acceleration and deceleration lanes were extended, and sound barriers were erected. Construction crews also rehabilitated the I-95 roadways and ramps connecting to I-80. To accelerate the project, the local lanes were closed; three lanes of traffic were maintained in each direction utilizing the two existing express lanes and the shoulder lane. The three-year, $93 million project was completed in 2005. DO YOU BELIEVE IN MAGIC? In 2000, the NJDOT activated the $45 million "MAGIC" intelligent transportation system along I-80 and other North Jersey roadways. The "MAGIC" system, which stands for Metropolitan Area Guidance Information and Control, uses radar, pavement sensors, electronic message signs, fiber-optic cable and closed circuit cameras to alert drivers to traffic accidents or weather hazards, and to post the best alternate routes. My dad remembers I-80 as being constructed between EXIT 26 (US 46) in Netcong and EXIT 38 (US 46) in Denville from the early 1960s on. When he was in high school, he and his friends used to use the developing roadbed of I-80 as a model airplane flying field. You can tell, even today, that EXIT 26 (westbound exit only, eastbound entrance only) was the end of the line. There is a railroad line parallel to US 46 at EXIT 26, which likely inhibited the ability to construct ramps at this location. The former DL&W main line (then Erie-Lackawanna and later Conrail) goes from Netcong to Hackettstown, crossing over I-80 at EXIT 26. The bridge over US 46 (which has a date of 1960) is curved, and quite long to cross over both sides of the divided highway, as well as the railroad. Due to the location of the next exit west, there was apparently no need to construct EXIT 26 as a full interchange. I remember when getting across New Jersey from the Poconos via I-80 was a hassle! The road ended very quickly at EXIT 4, and you ended up on US 46. The only reason I mention this is a place called "Hot Dog Johnny's," a diner that still exists in Buttzville. RELIEVING I-80 THROUGH PATERSON… I-80 should be widened to eight lanes (four through lanes in each direction) between EXITS 57 A-B (NJ 19 Freeway) and EXIT 60 (NJ 20). Under the present configuration, congestion occurs often on the six-lane section. Widening this section would provide at least eight lanes from the I-95 terminus west to EXIT 53 (NJ 23 Freeway). Converting the fourth lane of I-80 from HOV to general purpose between EXIT 34 and EXIT 45 has not helped the horrendous traffic congestion there, and carpooling is out as a viable option. My recommendation is to set up a three-lane reversible express roadway between Netcong (just east of EXIT 27) and I-280 (EXIT 47). The highway would go from 3-3 and 4-4 configurations to a 3-3-3 configuration. During the morning rush hour, the center roadway would be eastbound, such that six lanes would be provided eastbound, and three lanes would be provided westbound. This setup would be reversed during the evening rush hour, with the provision of six lanes westbound, three lanes eastbound. During non-rush-hour periods, the reversible express lanes would be open to eastbound traffic only. The express roadways would have occasional crossover ramps to the local lanes of I-80 from either side, but no direct exits to local streets. Trucks would be prohibited from the express lanes, and the width of the roadways would be narrowed to 11 feet. However, full-width shoulders would be provided. The reversible express lanes would utilize congestion pricing. EZ-Pass would be used to collect a toll of $1.00 for all 20 miles during non-rush-hour periods, and $2.50 during rush-hour periods. …AND THROUGH THE DELAWARE WATER GAP: The DRJTBC's proposal to widen I-80 to six lanes from EXIT 309 (US 209) in East Stroudsburg, Pennsylvania east to EXIT 4 (US 46 and NJ 94) in Columbia Township, including the reconstruction of the Delaware Water Gap Bridge, should be implemented immediately. In addition, I-80 should be widened to six lanes west to EXIT 293 (I-380) near Pocono Summit, Pennsylvania. To accommodate current and anticipated traffic needs through the Delaware Water Gap area, a new 22-mile-long bypass should be constructed from EXIT 4 (US 46 and NJ 94) in Columbia, New Jersey west to EXIT 293 (I-380) near Pocono Summit, Pennsylvania. Once the I-80 bypass is completed, the existing four-lane I-80 through the Delaware Water Gap and Stroudsburg should be re-designated I-680. The new I-680, which would then be reconstructed, would serve local traffic and maintain its 55 MPH and 50 MPH speed limits, while the I-80 bypass would serve express traffic and have a 65 MPH speed limit. SOURCES: "Freeways Are Now Urged," The New York Times (12/13/1936); Joint Study of Arterial Facilities, Port of New York Authority and the Triborough Bridge and Tunnel Authority (1955); "Plans for Bergen Expressway Stir Protest in Passaic County" by George Cable Wright, The New York Times (1/17/1956); "Jersey Acts To Speed U.S. Aid for Its $388.5 Million Freeway" by George Cable Wright, The New York Times (3/05/1958); "New Roads with New Numbers Will Parallel Old U.S. Routes" by George Cable Wright, The New York Times (9/19/1958); "Saving of $31,000 Yields $25 Million" by George Cable Wright, The New York Times (9/09/1960); Regional Highways: Status Report, Tri-State Transportation Commission (1962); Arterial Progress 1959-1965, Triborough Bridge and Tunnel Authority (1965); New Jersey Highway Facts, New Jersey Department of Transportation (1967); "Missing Link of I-80 Opened in Ceremony Near Columbia," The New York Times (11/09/1973); "Route 19 / Interstate 80 Interchange," Modern Steel Construction (October 1996); "Highway HOV Lanes Seem To Be an Idea Whose Time Has Passed" by Daniel Machalaba, The Wall Street Journal (8/27/1998); "Are HOV Lanes Helping Ease Traffic?" by George Lewis, NBC News (12/01/1998); "DOT's Electronic Signs Finally Get Their Smarts" by Pat R. Gilbert, The Bergen Record (6/22/2000); "Routes 80, 23 Flyover Ramp Opens to Public" by Scott Fallon, The Bergen Record (11/17/2000); "Route 80 Mess To Last Most of Summer" by Jeff Diamant and Mark Mueller, The Star-Ledger (6/24/2001); "DiFrancesco Backs Plan To Expand 65 MPH Speed Limit," The Associated Press (8/15/2001); "Route 80 Mess Nears an End" by Greg Saitz, The Star-Ledger (9/08/2001); "Route 15 Study," New Jersey Department of Transportation (2001); "Long and Winding Road to Improving I-287" by Rob Jennings, The Daily Record (3/12/2006); North Jersey Transportation Planning Authority; Chris Blaney; Phil Case; Frank Curcio; Rich Dean; Brian Inderwies; David Jackino; Michael G. Koerner; Raymond C. Martin; Christopher G. Mason; Richard C. Moeur; Dan Moraseski; Mike Moroney; Jim Padykula; Len Pundt; Ira Smilovitz; Derrick Stuart; William F. Yurasko. I-80, I-95, and I-680 shields by Ralph Herman. I-80 (New Jersey) exit list by Steve Anderson.